Maritimo is celebrating the 100-boat milestone for its most popular 48 Cruising Motoryacht with the launch of the Series II model. The M48 Series II takes on a number of the design concepts first seen with the new generation M56 and recently the M53 Cruising Motoryachts. The hallmark “wings” over the side decks have been deleted, giving the superstructure a more streamlined look. The hull now sports a large portlight on the port side to flood the master stateroom with natural light. Continuing the smoother look, the designers have also deleted the skipper’s door to starboard forward in the saloon and extended the starboard lounge forward to the bulkhead. This offers more seating to relax in the spacious saloon. The galley has not been overlooked, with full height refrigerator and full-height swing-out pantry included. Access between the galley and aft cockpit is dramatically improved with bi-fold doors that tuck away to open the entire saloon. Of course, the designers have maintained the most popular elements of the original craft first launched in 2007. The new M48 has the hallmark walk-around decks and internal staircase, three cabin/two bathroom accommodation, spacious saloon and large flybridge. In fact, the flybridge has been slightly extended and a sunroof is now standard. The Maritimo M48 Cruising Motoryacht Series II will be launched in January 2011. 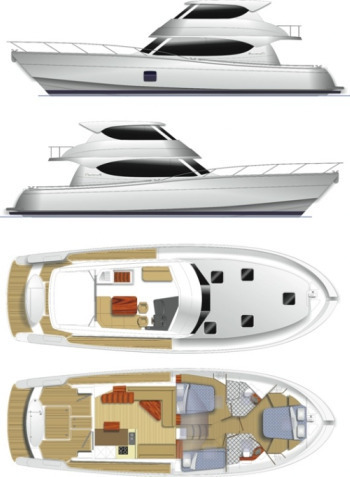 Already the company has orders for four of the new model with the first boat bound for South Africa.